Crowds of well-wishers filled the international Race Village and lined the banks of the Thames to wave off the 12 courageous crews and their professional Skippers in the tenth edition of the famous biennial Clipper Round the World Yacht Race. Wendy Tuck, 50, from Sydney, is the first female Australian Skipper in the history of the Clipper Race, and 50 Australians will compete in various teams. The fleet of twelve identical 70-foot ocean racing yachts, along with a flotilla of RNLI support vessels and spectator boats, participated in a spectacular parade with London's iconic Tower Bridge lifting to salute the crew twice ahead of their ocean odyssey. Wendy said: 'I am feeling very excited, although apprehensive, ahead of the start of something so daunting. 'I am not letting my nerves show in front of my crew though. We have been training and prepping for so long now that we all need to start racing to take away the nerves. 'I am very proud to be representing Australia as the nation's first female Australian Skipper in the contest. Sailing into my home port of Sydney in December will be something to look forward to, before I compete in my ninth Rolex Sydney Hobart Yacht Race as part of the circumnavigation," she added. 'Our crew are everyday people who are taking on one of the world's toughest endurance challenges," stated Clipper Race founder and legendary yachtsman Sir Robin Knox-Johnston (76), who became the first person to sail solo non-stop around the world in 1968-9. Sir Robin established the Clipper Race so that novice sailors could experience ocean racing and, for some, a full circumnavigation. 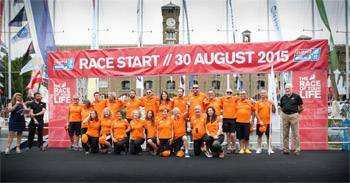 Nearly half of the 700 crew, representing 44 nationalities, from all walks of life, had never sailed before undergoing their extensive pre-race training. The youngest is 18 and the oldest is 74. 35 per-cent are women. Ross Ham, a 58-year-old from Brisbane, is the race's first double circumnavigator ever having completed the full circumnavigation in the Clipper 2013-14 Race. He said ahead of the start: 'I must be a little bit mad to be doing it all again, but I enjoyed the last race so much and the regimented life on board fits me like a glove. 'This time I know what to expect so am looking forward to helping my crew mates settle into racing life quickly." The Clipper Race is a life-changing experience for the crew who are following in the footsteps of more than 3,300 people who have taken on some of the world's toughest oceans in this unique global challenge since its inaugural race in 1996. Sir Robin added: 'Irrespective of their amateur status Mother Nature pulls no punches. They're going to go through some of the roughest waters in the world; in fact the roughest waters in the world. I wish them a safe and an extraordinary journey – the experiences ahead will stay with them for life." The event comprises twelve teams of amateur crew aboard identical 70-foot ocean racing yachts which are each led by a professional skipper. Teams are sponsored by global destination, business and consumer brands, which include debuts for cities such as Da Nang - Viet Nam and Visit Seattle. GREAT Britain is making its second appearance after finishing second in the previous edition and Northern Irish entry Derry~Londonderry~Doire is making its third outing. The longest successive competitor is the Chinese city of Qingdao, host of the sailing events of the 2008 Beijing Olympic Games, which has used the race as a major part of its legacy programme; this is its sixth campaign. Many of the crew fundraise for various charities and to mark the tenth edition of the Clipper Race, Unicef has been made its first official global charity partner. The charity has also been gifted a branded yacht entry by the organisers to help it raise its global profile and highlight its international projects at ports of call to help children in danger. Race 1 starts Monday 31 August at 12.30 BST (11:30 UTC). Following the first stopover in Brazil, the fleet will continue on via Cape Town, Albany - Western Australia, Sydney (including the world famous Sydney-Hobart Race), the Whitsundays, Da Nang - Vietnam, Qingdao - China, Seattle, Panama, New York, Derry-Londonderry and Den Helder – the Netherlands, before returning to London's St Katharine Docks for Race Finish on 30 July 2016.